Using the perfect video camera is essential in creating great YouTube videos. No matter what topic you discuss, your subscribers and those who discover your videos will need to see and hear your video clearly to continue interest in your channel. Read along to learn about the best video cameras used by the most successful YouTubers of 2017. The Canon 70D is a very popular choice of camera in the video-blogging world. People who record makeup tutorials and cosmetic reviews, for example, find this to be one of the best video cameras on the market because its battery stays charged for an incredible amount of time. This Canon captures videos in high definition of modes up to 1080p. It even has the option to modify color tones, and with ease with the use of a touch screen. If you’re looking to show your viewers even the finest of details and use the most modern methods of filming, the Canon 70D is the best choice for you. If you want a camera that can swift motions, look no further. The DJI Osmo is known for its steadiness and is perfect for video-bloggers who are constantly on-the-go. The DJI Osmo not only captures quick movement, but does so without losing image quality, shooting videos in up to 4K quality. Use this camera if you plan to record sports, run, or tread through rocky terrain. The Sony Alpha a7RII for those interested in customizing the hardware of their camera to adjust to the needs of their work. If you already own professional lenses from other cameras, you can be resourceful by using them with this Sony. Video-bloggers who don’t want to tote around heavy equipment would enjoy this camera, as well, because it is small, lightweight, and easy to carry. Though it may be small, it still produces stunning photographs and YouTube videos. Low-maintenance video-bloggers would find the Sony Alpha a7RII desirable. This Panasonic camera has many features that even beginner video-bloggers can appreciate. It is affordable, but it doesn’t come with the issues you find in many other inexpensive cameras. This Panasonic has a quiet auto-focus setting, which is usually not the case for even the most exclusive recording equipment, yet is sensitive to sound, which allows viewers to hear the video well. This camera also produces rich colors and is quick to adjust to unexpected changes to the lighting in videos. You can focus the camera manually while maintain 4K quality. If you’re considering a career or a hobby in video-blogging, the Panasonic LX10 is an excellent place to start. The GoPro Hero 5 is one of the best video cameras for video-bloggers looking to save time without losing quality. While it captures motion with spectacular precision with 4K quality and a 12.0-megapixel camera, it has multiple unique features. This GoPro seamlessly syncs your videos to your smart phone, where the user can view their YouTube videos right in the palm of their hand. This camera even comes with its own video-editing software so video-bloggers can quickly make improvements to their work on their phone before posting their content to their subscribers. If you’re looking to keep your work on your smartphone and focus on several projects at once, the GoPro Hero 5 is a great option for you. Those are our picks for the top video cameras to shoot YouTube videos in 2017 and going forward into 2018. 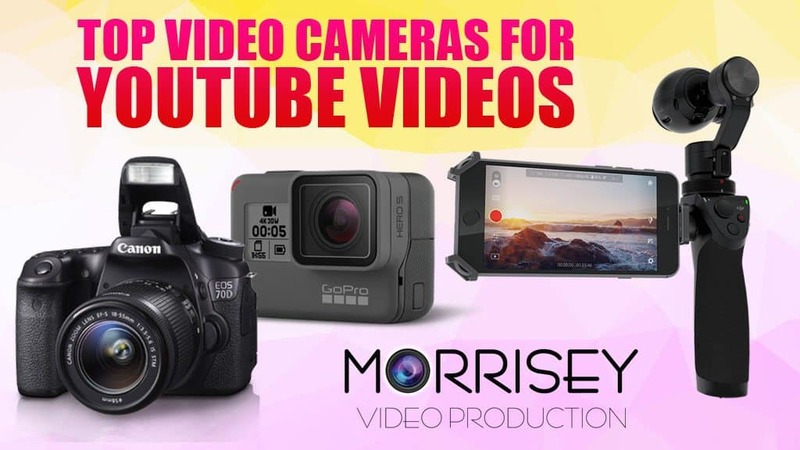 If you want to see some of our videos then subscribe to us at the Morrisey Productions YouTube Channel or follow us on Instagram at Morrisey Productions.